main text by William Laurance at e360.yale.edu/featu…. illustrations and #FreeWestPapua info added…. The Indonesian government is building a 2,700-mile road network on the island of New Guinea, opening up some of the world’s last great tropical rainforests to development and threatening unique indigenous cultures. Can international pressure force Indonesia to scale back this megaproject? New Guinea is also among the most culturally and linguistically diverse places on earth, with human populations that are genetically distinct from all others alive today. Not until the 1930s did the Western world discover many hundreds of unique indigenous societies in New Guinea’s vast mountains and highlands. And only in the 1950s did European colonists, miners, and loggers begin to exploit the region. Today, these unique rainforests are being carved up by a massive, ill-advised, and exceptionally risky road-building scheme. The Trans-Papua Highway will sprawl like a massive spiderweb over much of the Indonesian-ruled, western half of New Guinea, known as Papua or West Papua. Totalling 2,700 miles in length, this highway network will penetrate deeply into densely forested or remote mountainous regions to increase access to minerals, fossil fuels, timber, and land for agri-business ventures, including vast palm oil plantations. Many road segments will traverse precariously steep, virgin terrain. 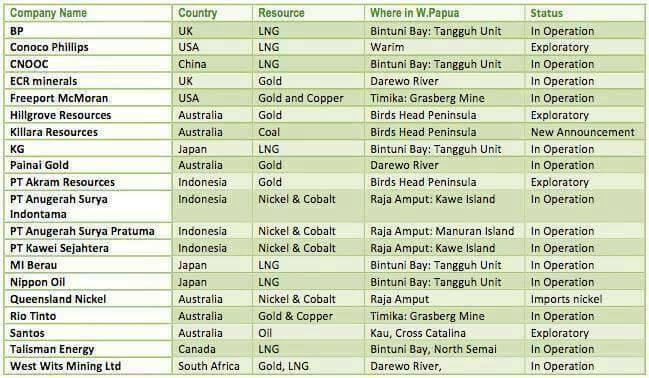 Here are some of the companies and countries supporting the Asiatic Muslim Indonesian military genocide of our people in West Papua. We know that these pictures are graphic; however, we believe it’s important to show our people worldwide what is happening to our Brothers and Sisters in West Papua. They are fighting one of the most violent groups of Islamic Muslim Extremists/Terrorist Groups in the world. And if these blatant acts of barbarism don’t represent Islamic Extremism at its worse, we don’t know what does. 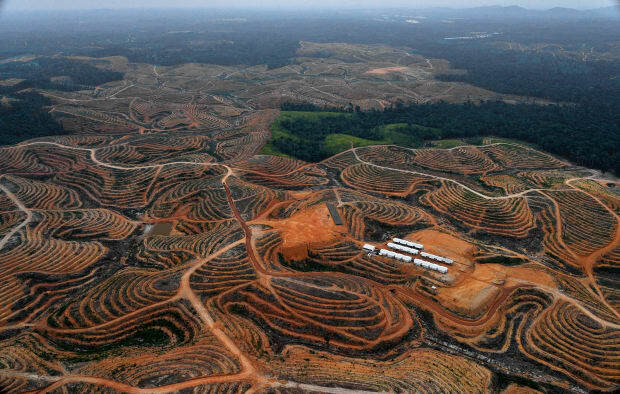 Recent analyses conducted by my research team suggest major new hotspots of deforestation will be created by the roads, along with sharp increases in forest fragmentation, biodiversity loss, and greenhouse-gas emissions. People in the know say its only a matter of time before environmental chaos descends in Indonesian New Guinea. First, the government there places little emphasis on the rights of the island’s many indigenous communities, who have lived on their traditional lands for millennia. Third, oil palm is exploding across Indonesia New Guinea. 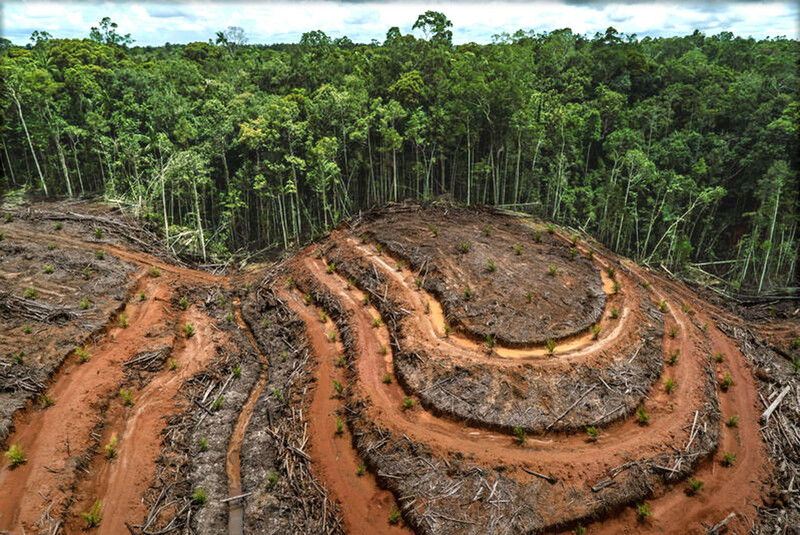 The Indonesians have a saying, “Sumatra was yesterday, Borneo is today, and New Guinea is tomorrow”, reflecting their wildly ambitious plans to expand oil palm, logging, mining, and other developments across the island at the expense of native ecosystems. The government says the Trans-Papua Highway will bring jobs, badly needed infrastructure, and improved living standards to the people of the region. But many indigenous Papuans fear that the highway will primarily benefit agribusiness and mining interests, as well as large numbers of settlers from other parts of Indonesia. Work on the highway is currently suspended because of a deadly attack on road workers last month. In political terms, New Guinea is deeply schizophrenic. Its eastern half comprises the nation of Papua New Guinea — a loosely governed state where indigenous groups have well-established legal rights to their traditional lands. Indonesian-ruled Papua is another story. Since assuming control in the 1960s, Indonesia’s Jakarta-based government has pursued two goals: exploiting Papua’s resources while consolidating top-down control. Both objectives have been advanced by vast logging, mining, oil palm, and agri-industrial projects that have flattened tens of millions of acres of forest — often while running roughshod over the land claims of its indigenous peoples. 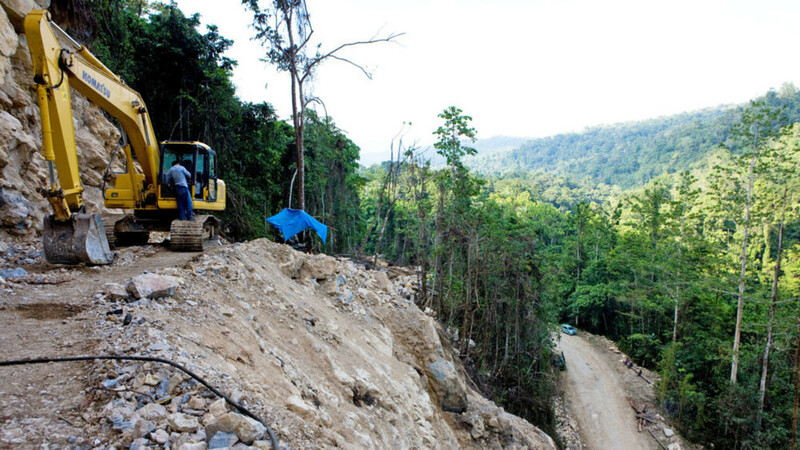 The construction of this extensive road system spells the beginning of the end for expansive wild areas in Papua. 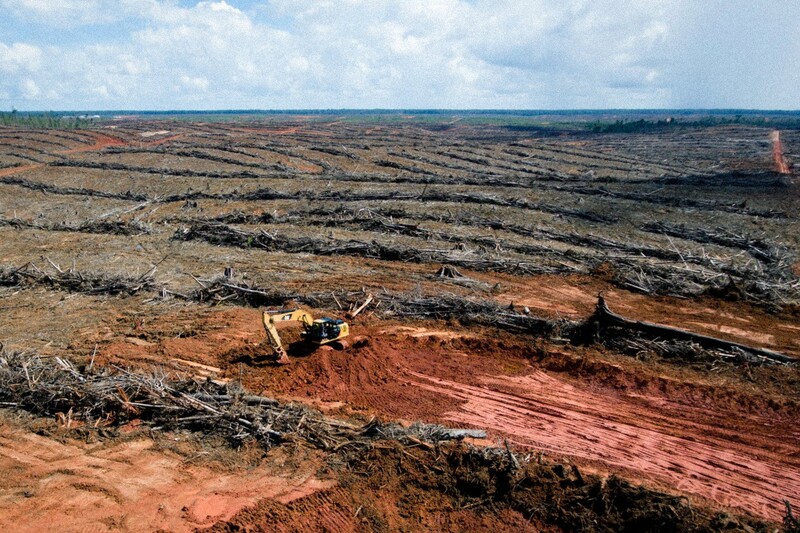 But as bad as Indonesia’s exploitation of Papua’s priceless forests has been to date, the Trans-Papua Highway is bringing a whole new level of destruction, essentially tearing the heart out of a damaged but not yet decimated tropical paradise. Among the worst impacts of the Trans-Papua Highway will be three major new deforestation hotspots. One of these, in central Papua, will abut the world-famous Lorentz National Park, a World Heritage Site, bringing forest disruption right into the park. 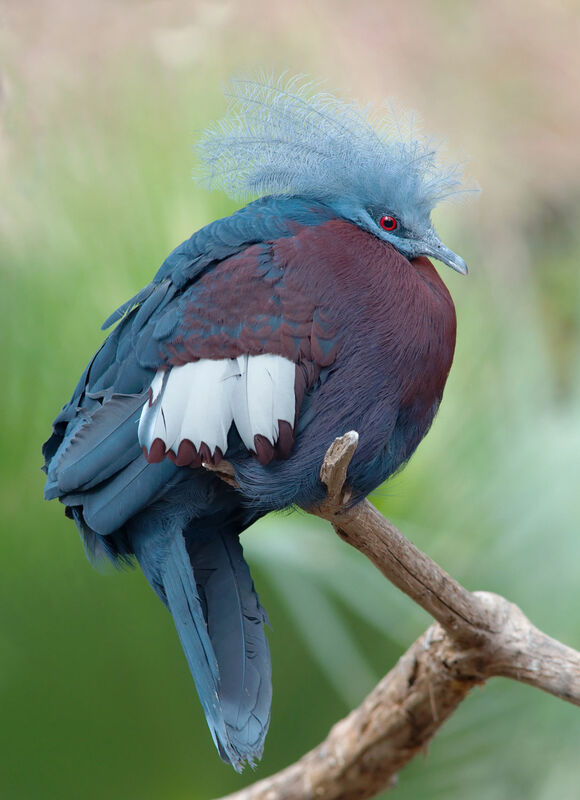 Lorentz is a global jewel, recently ranked 13th out of more than 173,000 protected areas worldwide in terms of its biological uniqueness and irreplaceability. A September 24, 2015 photo taken by the Moderate Resolution Imaging Spectroradiometer (MODIS) aboard NASA’s Aqua satellite showed dozens of active hotspots burning in southern New Guinea, on both sides of the Indonesia-Papua New Guinea border. Fires were particularly clustered in areas where forests and peatlands have been cleared and degraded by loggers and for industrial agriculture as well as open grasslands. Lorentz is so highly valued because of its rare Australasian biodiversity, its size (at over 900,000 square miles it is the largest protected area in Southeast Asia), and its massive elevational and geological variety; the park stretches from the southern coast and lowland rainforests to the snow-capped peaks of Papau’s central mountain range. As a result, Lorentz should be relatively resilient to climate change because species could migrate along its varied elevations and find local refuges during droughts or other extreme events. The park’s biodiversity is renowned, harboring 80 percent of Papua’s native mammals, two designated endemic bird areas, 34 distinct vegetation types, and many relict species of great evolutionary significance dating to the time more than 180 million years ago when all the Southern Hemisphere’s landmasses were joined in the supercontinent, Gondwana. As part of the Trans-Papua Highway, roughly 120 miles of new roads will cut across Lorentz, greatly increasing human access to 124,000 acres of designated mining concessions inside the park. In environmental terms, this is a giant red flag: Indonesia has a long history of downgrading or downsizing its protected areas to allow access to minerals, timber, or other resources. Increased roads inside Lorentz will surely intensify pressures to exploit the park and its adjoining forests. As is always the case, the construction of an extensive road system spells the beginning of the end of these wild areas as roads open the way for illegal deforestation, poaching, wildfires, and land investors bent on encouraging a building boom. 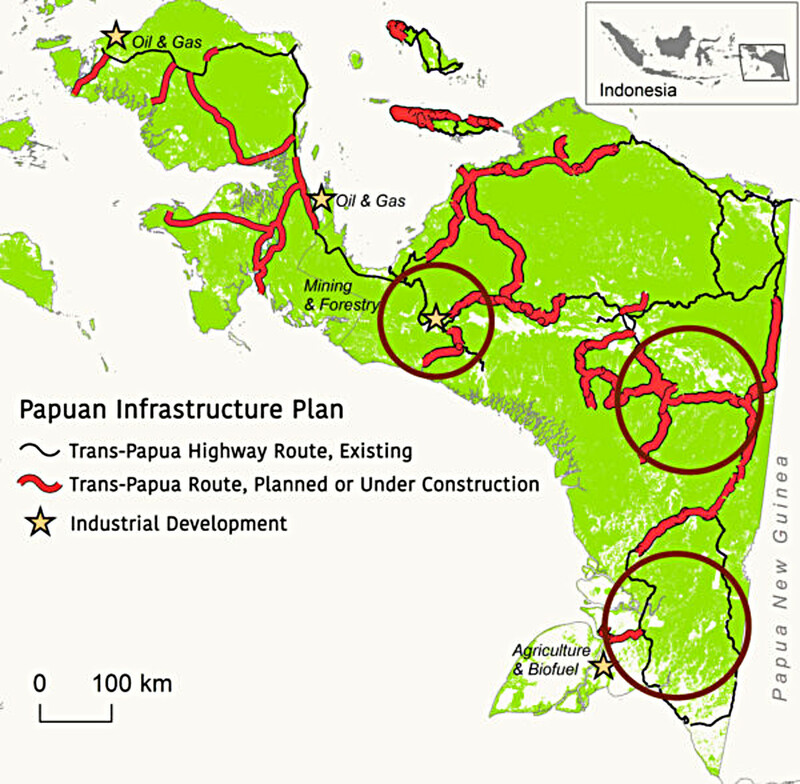 Unfortunately, the Trans-Papua Highway is just one small part of a global tsunami of infrastructure expansion. By 2050, the earth could accumulate another 15 mil­lion miles of paved roads, according to the International Energy Agency — enough to circle the planet more than 600 times. Around nine-tenths of all new infrastructure is slated for developing nations, which are home to nearly all of the world’s tropical and subtropical forests. ALSO ON YALE E360 How China’s colossal overseas infrastructure initiative threatens global climate progress. Read more. 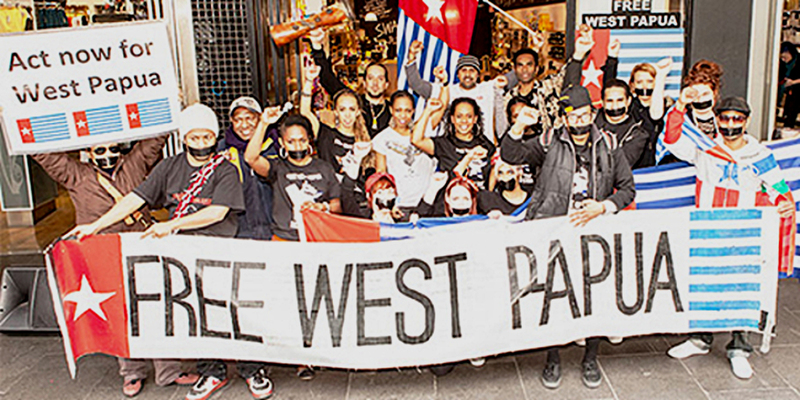 #FreeWestPapua a group supporting self-determination holds a Free West Papua protest in Melbourne. As part of its development scheme for Papua, Indonesia has used a massive transmigration program to attract upwards of a million settlers to Papua from elsewhere in Indonesia. Most settlers are aligned with Indonesia’s Muslim-majority rulers, and so have been ceded large land holdings and many economic and political opportunities. This has ignited conflicts between the migrants and indigenous Papuans — tensions that are palpable today. Papuan independence and protest movements flare up sporadically, but are heavily suppressed by the Indonesian police and military. Log depot in destroyed forest. 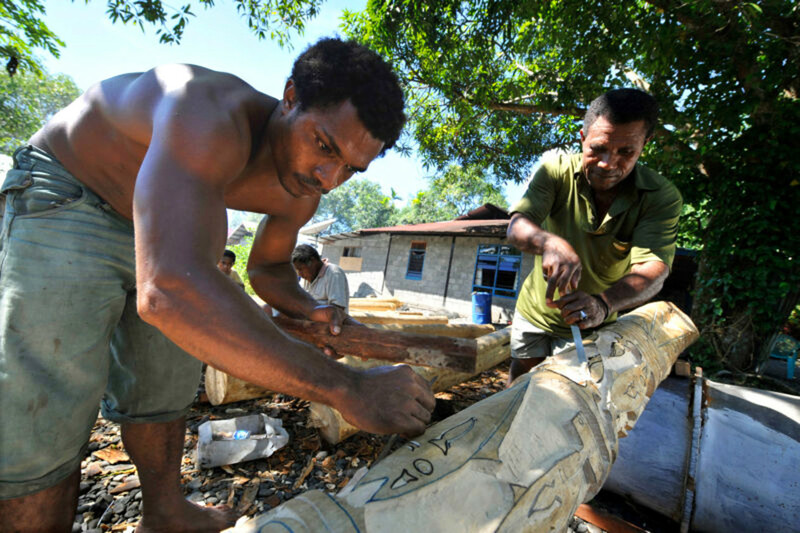 Global Witness tracked the wood from PNG to China, then from China to major US retailers. 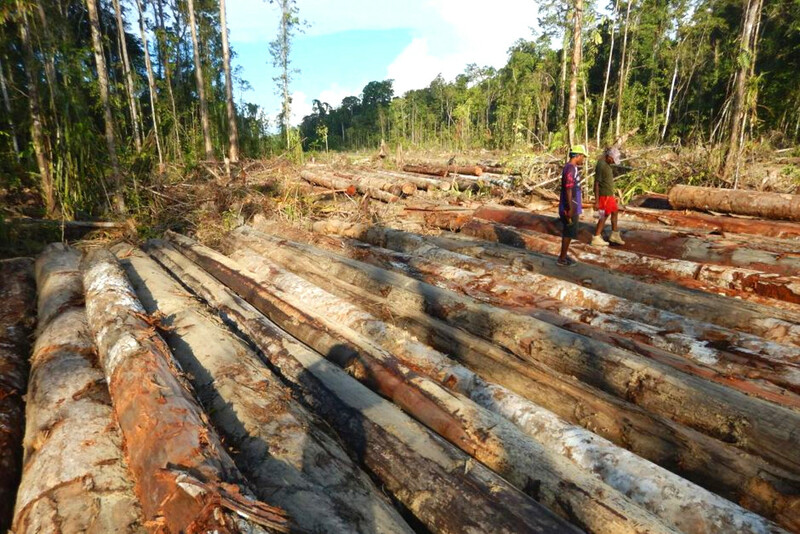 In addition to the Trans-Papua Highway’s incursion into Lorentz National Park, a second deforestation hotspot is in southeastern Papua, an area with extensive lowland forests and vast tropical peatlands that have built up over thousands of years. The habitat complexity and species diversity of this region is remarkable, with rainforests, towering wet-sclerophyll forests, riparian forests, peatlands, and mangroves all comprising some of the world’s great remaining intact forest landscapes. The high prevalence of acid-sulfate soils makes it an economic calamity for most crops, but that has not stopped Indonesia’s central government from undertaking wildly ambitious schemes, such as a massive rice and oil palm venture that could span 4 million acres. If these schemes proceed, toxic runoff from acid-sulfate soils, fertilizers, pesticides, and gold mining could devastate some of the world’s richest coral reefs and coastal fisheries just offshore. Last month, anti-government rebels killed nearly two-dozen road workers along the Trans-Papua Highway. Globally, the burning and decomposition of carbon-rich peatlands is one of the largest sources of greenhouse gas emissions from land use change. In Indonesia, peat fires also generate most of the choking haze that has repeatedly plagued much of Southeast Asia, forcing widespread closures of schools and airports and sharp increases in respiratory distress. One study suggests that haze from Indonesian fires could have caused the premature deaths of more than 100,000 people in 2015 alone. Indonesian President Joko Widodo has pledged to reduce haze, but it is difficult to imagine how this will be achieved if massive peat-fires in Papua are added to peatlands burning in Sumatra and Indonesian Borneo. The third deforestation hotspot is in central-eastern Papua, and will consume some of its most remote and least explored ecosystems. These include both lowland forests and high-altitude cloud forests, as well as alpine regions that are bastions for relict Gondwanan species, such as marsupials, cassowaries, and many archaic plants. The region also is home to diverse indigenous peoples. By slicing through the traditional lands of so many different indigenous groups, especially in the remote highlands, the new roads will almost certainly provoke anti-government sentiment. Last month, anti-government rebels killed nearly two dozen road workers along a stretch of the Trans-Papua Highway in eastern Papua. 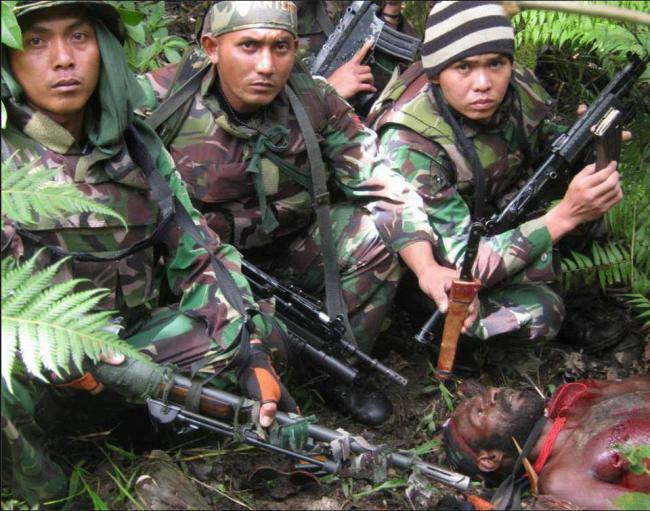 The rebels, affiliated with a militant wing of the Free Papua Movement, say that more attacks are coming, while the Indonesian police and military are promising rapid reprisals. Indonesia has 54,000 square miles of customary land claims currently under review, but virtually none are in Papua, indicating just how poorly the Indonesian government has treated traditional Papuan land rights. Given the resentments against Indonesia’s heavy-handed rule, massive road building across Papua’s remote indigenous lands could be like dousing a fire with gasoline. It is often assumed that people living in remote regions welcome new roads, but in fact opinions are deeply divided, says Selwyn Moran, an indigenous social activist who lives in southeastern Papua. “Papuans feel roads are something you ought to be grateful for, but they fear the militarization, non-Papuan migrants who assume dominant roles, and extractive industries” that come with roads, Moran said. ………… continues below .. The impact of illegal logging has been having a profound effect, as highlighted by report issued by Indonesia’s anti-corruption commission. According to the report, 629 million cubic meters of timber vanished on the black market between 2003 and 2014. This has caused the Indonesian Government to lose billions in tax revenue. Such illegal business does not just negatively affect the environment by increasing CO2 emissions and enhancing global warning. It also denies livelihoods to communities, breeds wider criminality and deprives crucial tax receipts of local and national government. The Forest Law Enforcement, Governance and Trade (FLEGT) Action Plan is the EU’s response to the problem of illegal logging. Why is the full implementation of the VPA significant? “The VPA’s full implementation is a huge chance and a tribute to the work of industry, policymakers and NGOs in Indonesia and in Europe´´. As an analysis by my colleagues and I has shown, the Trans-Papua Highway rests on shaky financial foundations. The Indonesian government has invested tens of billions of dollars in the network, but the project has yet to surmount the most challenging terrain. Road construction in high-rainfall tropical environments is notoriously expensive, especially in steep or swampy areas where extensive bridges, culverts, and heavy earthworks are required. The planned road segments just in Lorentz National Park will require more than 50 separate bridges. In addition to large capital costs, maintenance costs for roads in steep or high-rainfall environments are notoriously high — estimated at around 20 percent of the total road-construction cost per year by World Bank experts in Papua. And without concerted maintenance, expensive roads can quickly be rendered useless by landslides, potholes, and fissures. Further, in many developing nations, corruption in construction industries is so rife that up to half of all funding can be squandered by misappropriation and shoddy construction practices. The Trans-Papua Highway’s many harmful effects and dubious financial foundations make it an exceptionally risky venture. My concerns asbout the Trans-Papua Highway are shared by a growing number of scientists and environmental and indigenous rights groups in Indonesia and internationally. My hope is that this opposition will snowball as Papua’s development controversies increase. The fact is that the Trans-Papua Highway’s many harmful effects and dubious financial foundations make it an exceptionally risky venture for national and international investors. Indonesian and Chinese interests are prevalent, and as history has shown, they often have a dismal environmental track record. But the entire world, including many Western corporations, consume minerals, timber, palm oil, and other agribusiness products from Papua. This is one area where conservation and non-profit groups can have some leverage over the Indonesian government as efforts grow to scale back the negative environmental and social impacts of the highway. ALSO ON YALE E360 Vanishing Borneo: Saving one of the world’s last great places. Read more. The World Bank has called big infrastructure projects a “blunt instrument” for alleviating poverty. Right now, the Trans-Papua Highway is looking like a very blunt instrument — one intended to dominate nature, exploit resources, and politically subjugate a remote land for hugely questionable gains. William Laurance is a Distinguished Research Professor and Australian Laureate at James Cook University in Cairns, Australia.